“Women Saints Through the Centuries” with Barbara Heil! Join Inside the Vatican Pilgrimages in this unique opportunity with Barbara Heil and our own, Deborah Tomlinson, on a sacred journey through Rome and nearby areas, encountering Our Lady and the feminine genius’ of the female saints, leaders and benefactors of the early Church and Rome. 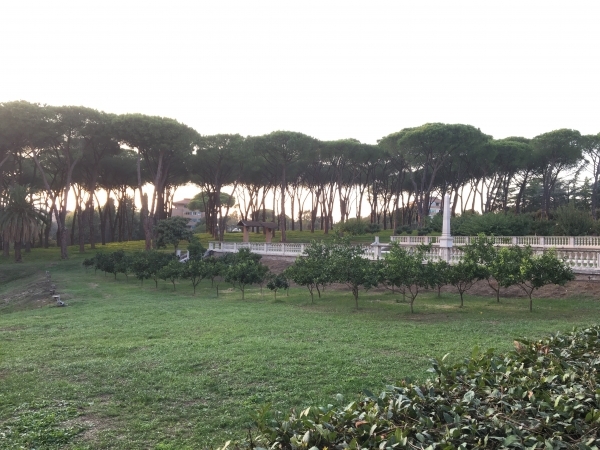 During our time in Rome we will be staying at the beautiful Villa Serenella, a stately, typically Roman villa-turned-monastery surrounded by 13 acres of olive groves, pine trees, and walking paths. Situated outside of the city, the Villa Serenella is a perfect place to retreat to and relax after a day of touring the city! Visit the Church of Three Fountains, Sebastian’s and Domino Quo Vadis and learn of their importance in the lives of Sts. Peter and Paul. Visit a winery in the famous Frascati region for a wine tasting of three wines paired with appetizers and an olive oil tasting. Attend a cooking class with the Italian chef at the Villa and learn to make tiramisu. While our primary focus during this pilgrimage is women saints of the Church, we have designed it for the enjoyment and spiritual enrichment of both men and women. I would like to invite you to join Deborah Tomlinson and myself on a Roman pilgrimage in the footsteps of venerable women of the Faith, who call us to enter with them into the Kingdom of Heaven. From the earliest days of the church, men and women have harkened to the call of holiness exemplified by countless women saints through history, and, of course, by the Mother of Christ herself. More than a tour, it will be a true pilgrimage – a journey both physical and spiritual – that we will travel through Rome and Assisi, where we will drink of the legacy and lives of many women who were faithful witnesses of the Faith through their lives, leadership, witness and even death. In Rome, we will visit the shrines of Sts. Prassedes and Pudentiana, early Roman believers, sisters and daughters of St. Pudens, baptized by St. Paul, and women who offered shelter to St. Peter! We will participate in a Papal audience and then go to Our Lady of Revelations where the Holy Mother Mary appeared. We will also visit the Vatican museums and the Catacombs of St. Priscilla, with its Marian depictions and mural of an early Christian woman. 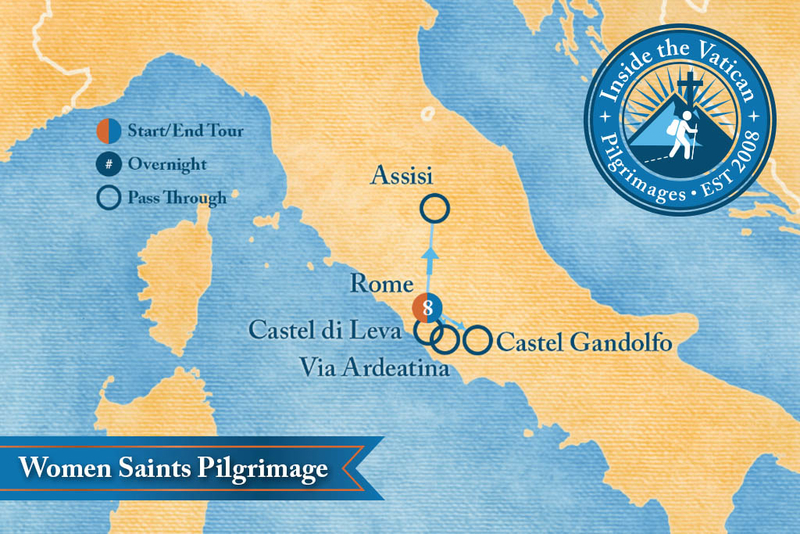 We will go to Assisi, to the chapels of St. Clare and of St. Francis, and continue our pilgrimage with special Masses, time for prayer and contemplation, returning to Rome to visit holy sites associated with St. Barbara, St. Mary Magdalene, St. Bridget, the Blessed Virgin, St. Monica, and more! Plus, we will see original Caravaggio paintings during our journey, as well as tour a nearby winery and enjoy an Italian cooking class for good measure! Please read the Information and Registration Packet for the complete schedule and make plans to join us for this unique pilgrimage in the footsteps of women saints through the centuries.